Perhaps you have successfully run your small chiropractic clinic with the assistance of a talented, hardworking billing clerk for many years. But your practice could be even more successful if your personnel have access to tools that facilitate easier practice management. Billing software with built-in electronic medical records and practice management tools can empower your staff to work smarter without working harder, and can make a positive difference in practice revenues. Because chiropractors treat specialized needs, not just any medical billing software will do. The billing software that an internist or dermatologist would use wouldn’t be ideal for the chiropractor’s clinic. Fortunately, exceptionally good chiropractic billing software is available, and it can start making your practice more efficient right away. Plus, as efficiencies accumulate over time, you can expect a less stressed staff, and better practice revenues. Here are 5 ways the right billing software can make your chiropractic practice more efficient. Billing and coding must be done to exacting specifications in order for insurance companies to reimburse you correctly and promptly. When your billing software is HIPAA-compliant and ICD-10 ready, and allows you to create a patient record in just seconds, you can be confident that fewer claims will be rejected due to mistakes. That means fewer claims have to be reworked, and staff time can be put to more productive use. Consistently producing accurate claims is one of the top ways to optimize your clinic’s earning power. When claims submission, billing, and other office functions are electronic instead of manual, everything happens faster, and usually with less effort. Claims are sent more quickly and reimbursed more promptly, so you can bill patient balances sooner. You’ll find that the average number of days accounts spend in Accounts Receivable drops over time, improving cash flow and making it more predictable. You can bill cash, MVA, Workers Compensation, and private insurance all from one convenient billing platform. Appointment schedulers and intake personnel can also make a difference in revenue cycle efficiency and practice profitability if your billing software includes tools just for them. For example, when the front office can enter payments and copayments from the appointment calendar, these can be collected up front rather than after a patient encounter, which will ensure that a higher percentage of these payments and copayments are actually collected and don’t have to be written off. Easier, more powerful appointment scheduling is another prized feature. Paper claims and bills did their job admirably for a long time, but today there’s a better way. Any process that can be translated from paper into an electronic process will be faster, more accurate, and less costly. Plus, it will make your practice “greener” because you’ll be using fewer resources. If you have been looking for ways to make your chiropractic clinic more environmentally responsible, billing software is a terrific solution, because it also improves cash flow and keeps the revenue cycle on track at every step. The more quickly you can collect on claims and bill patients for their part, the more likely you are to collect those revenues. When patient billing is delayed due to office inefficiencies, claims problems, or questions about qualifying chiropractic procedures, you’re less likely to collect patient portions of bills. But when patient-friendly billing is prompt due to your excellent billing software streamlining the claims process, they’re more likely to remember their patient encounter and less likely to believe your office is pursuing a frivolous expense. Billing software can make a tremendous positive difference in how well a chiropractic clinic operates. Inefficiencies and mistakes can be reduced or eliminated, and an efficiently managed practice can become even more efficient. You don’t have to make a major IT investment to have billing software that can do all this. 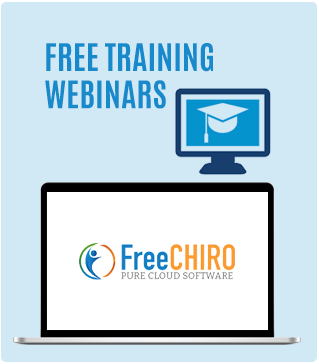 Click here to sign up for the free edition of FreeCHIRO and see for yourself what a difference it makes having billing software designed specifically for the chiropractic practice.